If your thoughts instantly skip to scenes from 28 Days later or The Walking Dead, you're on the right lines. From zombified ants to compliant cockroaches and reckless rodents: welcome to the wonderful world of parasitic mind control! Parasites are organisms that live on or inside another organism, using its resources to survive and often causing harm in the process. Like all living things, parasites need to find food, avoid predators and find a safe place to raise their young. But rather than working for a living, parasites steal what they need from other species. They use their host as a source of food and shelter - sucking its blood, hijacking its digestive tract, or consuming its flesh. This is the strategy of thousands of species of parasitoid wasp, which lay their eggs inside caterpillars, their young emerging to consume it from the inside out. Inside the caterpillar the wasp larvae are largely protected from predators, but their final stage of development, outside the caterpillar, leaves them very vulnerable. One solution to this problem is to manipulate the host into building a shelter for the developing larvae, and this is the strategy of the parasitoid wasp, Hymenoepimecis argyraphaga. Found in Costa Rica, this strange wasp begins by injecting a temporary paralytic and laying an egg in the abdomen of the spider, Plesiometa argyra. The spider slowly recovers, and the wasp larvae develop inside its body, feeding on its blood. The spider continues to behave as normal for several weeks, until the larvae are ready to pupate, at which point they begin to release chemicals inside the spider that have a rather strange effect1. The spider starts spinning a new web; a rather odd web. Known as a cocoon web, it involves just a few spokes radiating out from a central hub of silk, and is ideal for the pupating larvae to wrap themselves in. The spider is then killed, and a new generation of wasps emerges from their safe cocoon shortly after. Another way to keep your young parasites safe is to manipulate the host into directly providing protection, as parasitoid wasps in the genus Glyptapanteles do. The female Glyptapanteles wasp lays her eggs into juicy caterpillars of the geometrid moth Thyrinteina leucocerae, and for two weeks they develop, while the caterpillar goes on about its business like nothing happened. Eventually though, it's time for the new generation of wasps to emerge, and they do so by bursting out of the caterpillars body. Outside the safety of their caterpillar home, the wasp larvae need a safe place to pupate. Nestled in a nearby leaf, they enlist the wounded host to protect them. And, like clockwork, the caterpillar suddenly changes its behaviour - it stops moving and spends its time close to the pupae, knocking away approaching predators. These caterpillar bodyguards are highly effective - wasp larvae are twice as likely to survive under their protection2. To achieve this amazing feat, the parasitoid wasps must somehow influence the caterpillar's central nervous system after emergence - although researchers are still unsure as to how this might be achieved, one suggestion is that some larvae remain behind to take the reins, sacrificing themselves so that their siblings have a better chance to live. Another parasite of ants tells a similar story. In the tropical forests of South America, there lives a quite remarkable fungus. If a Carpenter ant (Camponotini) is unfortunate enough to eat spores of the fungus Ophiocordyceps unilateralis, those spores release chemicals into its brain altering its behaviour. The infected ant gives up its normal day-to-day activities and becomes a zombie. Defenseless against the fungus' tricks, the zombie ant leaves its nest, climbs the nearest plant and finds a suitable leaf, clamping its jaws down onto the stem. Here it remains, immobile, and completely powerless. Over the following hours and days, the fungus begins to sprout from the ant's head, growing a tall stalk that, at its tip, eventually produces spores. These spores are carried away on the wind, ready to infect more innocent ants. The zombie-ant fungus, as it's affectionately known, was first discovered in 1865, but we now know there are at least ten closely related species of fungus, which infect different species of carpenter ant the world over. Eight new species have been discovered in the last decade4,5, and there may be many more yet undiscovered. However, researchers believe that one fungus species, Ophiocordyceps camponoti-novogranadensis, may not be zombifying ants for much longer. Found at high elevations, this fungus is under threat from climate change, which scientists believe the ants will be able to survive but the fungus may not4. Good news for the ants, perhaps, but for us yet more evidence of how climatic changes are disrupting species interactions. All parasites must get from one host to another, but some species have highly complex life cycles with multiple hosts, magnifying the challenge of transmission. One of the most convoluted parasite lifecycles is seen in the lancet fluke (Dicrocoelium dendriticum), and this lifecycle calls for sophisticated host manipulation. During its life, the lancet fluke must move from its primary host (where it reproduces) in a cow (Bos taurus), through a snail (Cochlicopa lubrica) and finally an ant (Formica fusca). This amazing parasite has therefore evolved to infect three different hosts, and find a way from one to another. Getting from the cow to the snail is quite easy; lancet fluke eggs exit the cow in its dung - a tasty snack if you're a snail. Inside the snail, the flukes make their way to its respiratory system where they are eventually coughed up in a large ball of phlegm. This ball of fluke-infected mucus is just irresistible to the ants, which enthusiastically carry it back to their nest and consume it. But once infected with the lancet fluke, the ants start to act a little strangely. The following evening they leave the nest, climb to the top of a blade of grass and bite down. Here the ants remain, unflinching, until sunrise, when they return to the nest and act as though nothing ever happened. This ritual continues daily until one night, the selected blade of grass is eaten, completing the cycle and returning the flukes to their cow-shaped home, where they can reproduce once more. Is a Parasite Controlling Your Mind? Thankfully, the parasites I've discussed so far do not infect humans; their telepathic abilities are used on snails and ants instead. However, there is one parasite that some scientists believe may be influencing human behaviour. And about one in three of us are infected6. Toxoplasma gondii is a protozoan parasite whose normal life cycle takes it from cat to mouse and back again. It reproduces inside the digestive system of the cat, exiting through faeces, which is then consumed by mice and rats. Once inside its secondary host, T.gondii starts to manipulate behaviour, making the host more daring and risk-averse. Parasitised rodents, far from being scared of the odour of cats, are actively attracted to it7. Ultimately, this daredevil behaviour tends to get the rat or mouse eaten, returning the parasite to its primary host, the cat. This story would be no different than the others I have told so far, were it not for the discovery that Toxoplasma gondii can also be carried by humans. The infection is usually asymptomatic, so most people don't even realise they have it. However, research has shown that infected men find the smell of cat urine more appealing than normal8. No big deal though, right? A love of cat pee might be a socially unacceptable trait, but its not going to do you much harm. On the contrary, however, T. gondii infection in humans has now also been associated with a range of behavioural changes such as recklessness, aggression and impulsivity. For instance, one study found T. gondii infection correlated with a six-fold increase in the incidence of traffic accidents9. Even more concerning, T. gondii infection has been linked to schizophrenia10 and suicidal behaviour11. Toxoplasma gondii controls host behaviour through the formation of cysts in the brain, which secrete the enzyme tyrosine hydroxylase12, increasing production of neurotransmitters (chemicals which carry signals from neuron to neuron) such as dopamine and norepinephrine in the host's brain. Both these chemicals have been implicated in human behaviour and mental health, particularly depression and schizophrenia, and several antipsychotic medications have been found to slow T. gondii growth. Together this evidence suggests T. gondii infection in humans may play a role in mental health via its effects on neurotransmitters in the brain. Our understanding of how parasites are able to take the reins and control, or at least influence, the brain and behaviour of another organism, is still in its infancy. One of the best-understood examples of parasitic control comes from the Jewel wasp (Ampulex compressa), which infects cockroaches and hijacks their nervous system. The jewel wasp injects its victims with a cocktail of chemicals, which influence dopamine and octopamine signalling pathways in the brain13, suppressing normal walking behaviour and putting the cockroach into a trance-like state. The precision of this behaviour is remarkable; the wasp is able to inject chemicals directly into the sub-oesophageal ganglion of the brain; the region responsible for controlling movement. Post-injection, the wasp leads the cockroach to its preferred egg-laying location without resistance; the cockroach remains a calm and submissive slave, while retaining useful behaviours like predator avoidance. Manipulation of neurotransmitters such as serotonin, octopamine and dopamine, appears to be a common strategy for parasites to control host behaviour. Serotonin is likely to underlie parasitic mind control in many gammerid infections14, and dopamine appears to play a key role in T. gondii infections12, and is widely used by parasitoid wasps13. As well as releasing neurotransmitters directly, parasites can achieve the same behavioural modifications by influencing the biochemical pathways that naturally produce these proteins. For example, several gammarid parasites have been found to increase levels of arginine kinase, a regulatory protein involved in producing the neurotransmitter nitric oxide. Similarly, parasitic hairworms (Spinochordodes tellinni) cause their grasshopper hosts (Meconema thalassinum) to commit suicide by throwing themselves into streams, rivers and lakes, and studies have now identified several grasshopper neurotransmitters whose expression is altered by hairworm infection, as well as genes in the Wnt family, involved in gene regulation15. Humans, like all animals, interact with and manipulate their environment on a daily basis. We use chemicals such as pheromones and signals such as speech and gesture to influence each other, and we control the movement and diet of our domesticated animals. Perhaps it should come as no surprise, therefore, to discover that parasites are enacting such control over their hosts. And yet, the more we unearth about these feats of mind control, the more they continue to amaze and bemuse us. Understanding how parasites are able to manipulate behaviour teaches us about how our own brains work, and sheds light on the complex evolutionary processes that shape host-parasite relationships. Across the natural world, parasites are controlling the movement, aggression, risk-taking and even personality of their hosts. 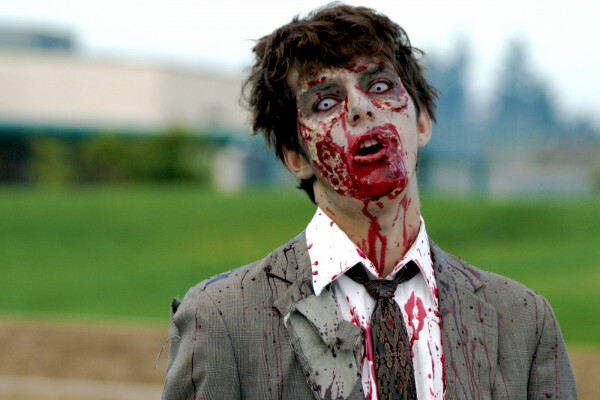 How far from reality are the popular culture zombies of film and television? Perhaps not as far as we might like.